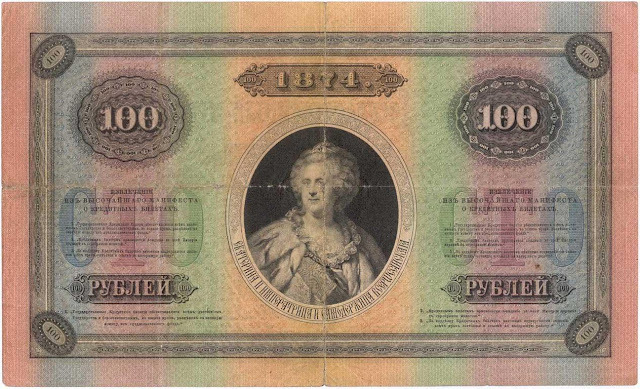 Obverse: On the left side of the banknote are imperial regalia: Coat of Arms of the Russian Empire, 1857 - Imperial Double-Headed Eagle above monogram of Czar Alexander II of Russia and Imperial Crown of Russia at top. On the right side depicted Guilloche rosette with the face value "100". On the obverse is the text: «Государственный кредитный билет. По предъявлении выдается из разменной кассы Государственного Банка СТО РУБЛЕЙ серебряною или золотою монетою». (State Credit Note. Payable to the bearer of this Note from the currency exchange offices of the State Bank the ONE HUNDRED RUBLES in silver or gold coins). Reverse: Portrait of Catherine II (1729 – 1796), also known as Catherine the Great, born Princess Sophie of Anhalt-Zerbst, was Empress of Russia from 1762 until 1796, the country's longest-ruling female leader. Around the portrait is written the inscriptions of full name and titles of the Empress: "ЕКАТЕРИНА II ИМПЕРАТРИЦА И САМОДЕРЖИЦА ВСЕРОССIЙСКАЯ". (Catherine II, Empress and Autocrat of all Russia). Two guilloche rosettes with the face value "100" and the words "СТО РУБЛЕЙ" (ONE HUNDRED RUBLES) at left and right and date of issue at upper center. 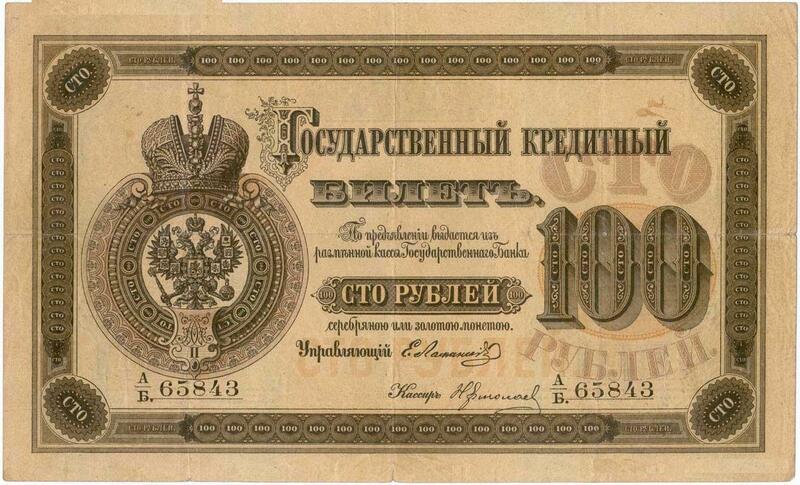 Watermark: The face value in arabic numerals "100" at lower corners and the words "СТО РУБЛЕЙ" (ONE HUNDRED RUBLES), abbreviation «Г. К. Б.» (Государственный Кредитный Билет - State Credit Note) on the top, the date of issue at lower center. Date of issue: 17 March 1869, according to the decree of 21 February 1869 (No. 45652). Withdrawn from circulation: This notes was exchanged for the new banknotes of 1887 issue, according to the decree of Jun 4, 1898 (№ 15523), until December 31, 1900. Not Payable from 1 January 1903. Size: 214 × 130 mm. The Imperial Crown of Russia, also known as the Great Imperial Crown, was used by the monarchs of Russia from 1762 until the monarchy's abolition in 1917. The Great Imperial Crown was first used in a coronation by Catherine II, and it was last used at the coronation of Nicholas II. It survived the subsequent revolution and is currently on display in the Moscow Kremlin Armoury's State Diamond Fund. By 1613, when Michael Romanov, the first Tsar of the Romanov Dynasty was crowned, the Russian regalia included a pectoral cross, a golden chain, a barmas (wide ceremonial collar), the Crown of Monomakh, sceptre, and orb. Over the centuries, various Tsars had fashioned their own private crowns, modeled for the most part after the Crown of Monomakh, but these were for personal use and not for the coronation. In 1719, Tsar Peter I the Great founded the earliest version of what is now known as the Russian Federation's State Diamond Fund. Peter had visited other European nations, and introduced many innovations to Russia, one of which was the creation of a permanent fund (фонд) to house a collection of jewels which belonged not to the Romanov family, but to the Russian State. Peter placed all of the regalia in this fund and declared that the state holdings were inviolate, and could not be altered, sold, or given away—and he also decreed that each subsequent Emperor or Empress should leave a certain number of pieces acquired during their reign to the State, for the permanent glory of the Russian Empire. The court jeweller Ekart and Jérémie Pauzié made the Great Imperial Crown for the coronation of Catherine the Great in 1762. The beautiful crown reflects Pauzie's skilled workmanship. It is adorned with 4936 diamonds arranged in splendid patterns across the entire surface of the crown Bordering the edges of the "mitre" are a number of fine, large white pearls. The crown is also decorated with one of the seven historic stones of the Russian Diamond Collection: a large precious red spinel weighing 398.72 carats (79.744 g), which was brought to Russia by Nicholas Spafary, the Russian envoy to China from 1675 to 1678. It is believed to be the second largest spinel in the world. In formally adopting the Western term Emperor for the ruler of Russia, Peter the Great also adopted Western imperial symbols, including the form of the private crowns (Hauskrone) used by the Holy Roman Emperors (of which the only surviving example is the Austrian imperial crown of Rudolf II, the Imperial Crown of Austria), in which a circlet with eight fleur-de-lis surrounds a mitre with a high arch extending from the front to the back fleur-de-lis. Already in Austria some baroque representations of this type of crown found on statues of the saints had already transformed the two halves of the mitre into two half-spheres, and this is the type of imperial crown used in Russia. Peter’s widow and successor, Catherine I, was the first Russian ruler to wear this form of imperial crown. In the Great Imperial Crown which the court jewelers Jeremia Posier and J. F. Loubierin made for Catherine II in 1762, these hemispheres are in open metalwork resembling basketwork with the edges of both the hemispheres bordered with a row of 37 very fine, large, white pearls. They rest on a circlet of nineteen diamonds, all averaging over 5 carats (1.0 g) in weight, the largest being the large Indian pear-shaped stone of 12⅝ cts in front, set between two bands of diamonds above and below. Posier showed his creative genius by replacing the eight fleur-de-lis with four pairs of crossed palm branches, while the arch between them is made up of oaks leaves and acorns in small diamonds surrounding a number of large diamonds of various shapes and tints running from the front pair of crossed palms to the back pair of crossed palms, while the basketwork pattern of the two hemispheres are divided by two strips of similar oak leaves and acorns from the two side pairs of palm branches stretching up to the rows of large pearls on their borders. At the center and apex of the central arch is a diamond rosette of twelve petals from which rises a large red spinel, weighing 398.72 carats (79.744 grams), one of the seven historic stones of the Russian Diamond Collection, which was brought to Russia by Nicholas Spafary, the Russian envoy to China from 1675 to 1678. It is believed to be the second largest spinel in the world. This spinel, in turn, is surmounted by a cross of five diamonds, representing the Christian faith of the Sovereign, the God-given power of the monarchy and the supremacy of the divine order over earthly power. Except for the two rows of large white pearls the entire surface of the crown is covered with 4936 diamonds and is quite heavy, weighing approximately nine pounds (by contrast, the Crown of Monomakh weighs only two pounds). It was unfinished in time for Catherine's coronation and the original colored stones (e.g., emeralds in the palm branches and laurel leaves) were replaced with diamonds for the coronation of Paul I in 1797, it was used at every subsequent coronation until that of Nicholas II in 1896 and was last in imperial period at the State Opening of the Duma in 1906.